The HubSpot-Salesforce integration may encounter sync errors which prevent data from syncing. You can identify and resolve these sync errors in your Salesforce integration settings. Click the Sync errors tab. The number in the tab represents the number of sync error types that have occurred. The sync errors dashboard displays the sync error type and the number of items affected by the sync error. To learn more about a sync error, hover over the error and click View details. The error details pane will display a descriptive summary of the error, as well as a list of affected items. Some errors will also include a More details section, which can be expanded to view specific information about the error. Follow the instructions or use the information in the error details to resolve the error. After you've resolved the issue(s) that caused the error, return to the sync errors dashboard. Hover over the error and click Resync to attempt resyncing the items affected by the error. If the error is resolved, the affected items will sync successfully and the error will disappear from the sync errors dashboard. Once all your sync errors have been resolved, the sync errors dashboard will display a No sync issues message. The contact has been converted from a lead to a contact in Salesforce, but the type of record created in Salesforce when a contact is created in HubSpot is Lead. To resolve this error, select Contact as the type of record to create in Salesforce. The HubSpot property and Salesforce field in a field mapping have incompatible field types. To resolve this error, change the field type of either the HubSpot property or Salesforce field to match the field type of the other. The contact is deleted or merged in Salesforce, but still exists in HubSpot. This error doesn’t prevent any data from syncing, but indicates that data in HubSpot and Salesforce might become out of sync over time. 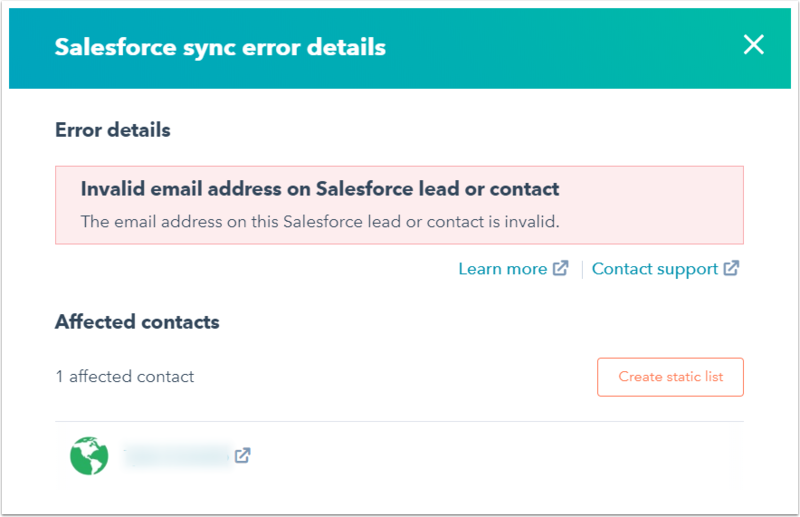 To prevent this error, choose to delete a HubSpot contact when its corresponding Salesforce lead/contact is deleted or merged. A user in Salesforce or a Salesforce operation is editing an object at the same time HubSpot is trying to sync with it. HubSpot will sync with the object the next time a sync is triggered, or if the object is manually resynced. HubSpot can't sync with the object because its Salesforce owner is inactive. To resolve this error, ensure that the Salesforce owner is active, or transfer the item to an active owner. The value provided is not a valid domain for the property. To resolve this error, double-check and enter a valid domain. A Salesforce field with options (usually a picklist field type) has two identical options, and HubSpot cannot identify which Salesforce option to sync the value in HubSpot with. To resolve this error, delete one of the duplicate field options in Salesforce. SOQL queries use the Salesforce Object Query Language (SOQL) to search for data that meets certain conditions in Salesforce, and Salesforce packages run code in a Salesforce organization to retrieve certain information. Each Salesforce organization is provisioned with a certain number of concurrent and total number of SOQL queries and code statements per day. This error is most commonly associated with third-party packages installed in your Salesforce organization, which can sometimes conflict with HubSpot. For example, a package that deduplicates records in Salesforce may conflict with HubSpot. To resolve this error, uninstall the third-party package. An item is assigned to a queue, but Salesforce doesn't support queues owning this type of item. A HubSpot object doesn't meet the requirements for a validation rule that is set on a Salesforce lead, contact, account, or opportunity record (e.g., Lead must have a company or Account must have a zip code). If an object can't sync with Salesforce because of a validation rule, the sync will fail indefinitely. To resolve this error, remove the validation rule in Salesforce.